These distinctive Shaker-style shutters are the essence of simplicity. The clean lines of flat panel shutters reflect the traditional Shaker sense of order, neatness and utility. Open Board and Batten shutters work well on historic homes, from rural cottages to Northeastern brownstones and Tudors, and are also great for Southwest desert architecture. Often found on French Country and Spanish–style houses and cottages, substantial Joined Board and Batten shutters were originally designed to protect windows during strong storms. These tropically-inspired shutters are different from others because they’re hinged on the top, rather than the sides. They consist of one louvered panel that is held out at an angle from the bottom. If you want to upgrade your home’s curb appeal, you can never go wrong with wood shutters. These fixtures have been around for ages and they have become an integral part of home construction. 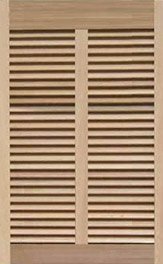 At Decorative Shutters, we have a wide range of sturdy wooden exterior shutters to suit any home style, and we invite you to have a look. Whatever exterior wood shutters you have in mind, we have it for you. These shutters not only give your home a dash of classical style but also protection, privacy, and natural ventilation. Talk to us today for the best selection of wood shutters for your home.